The humble ginger nut – one England’s favorite biscuits’, and the biscuit with probably the least attractive and appetizing name. 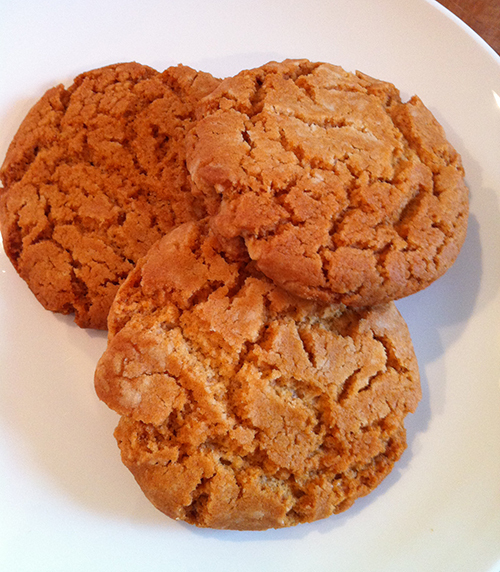 This recipe is typically English; it contains a nice amount of ginger, golden syrup and offers a wonderful crunchiness and snap as you break one in half. Sift the flour, baking powder, ground ginger and baking soda together into a mixing bowl, add the sugar, then lightly rub in the butter with your fingertips until the mixture resembles find breadcrumbs. Add the syrup and mix everything to a stiff paste. No liquid is needed because the syrup will be enough to bring the mixture to the right consistency. Divide the mixture into quarters, as evenly sized as possible, then each quarter into four, and roll the pieces into little balls. Next place them on the baking sheet, leaving plenty of room between them because they spread out quite a bit. Then just flatten them slightly (to about 1.5cm) and bake near the centre of the oven for 10–15 minutes by which time they will have spread themselves out and will have a nice cracked appearance. Cool them on the baking tray for 10 minutes or so, then transfer them to a wire rack to finish cooling. These biscuits will keep for 3-4 days in an airtight container (if they last that long).